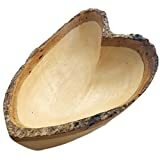 Squirrels store their nuts in trees, so why argue with nature's experts and store yours in a tree too with these cool new Wood Bark Nut Bowls. These rustic wooden nut bowls are handcrafted from sustainably harvested mango wood trees and feature rough-textured bark exteriors and smoothly finished interiors. They come in small and large sizes, but handy nut-gathering squirrels are not included. 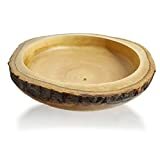 Lipper International 1062 Acacia Tree Bark Bowl, 11"